Lenovo India has launched their latest budget-oriented offering, the K8 Note, in India. 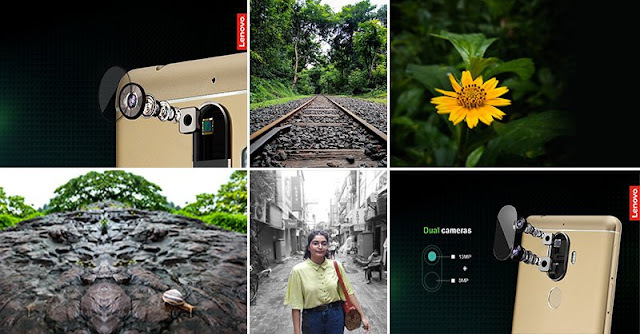 The highlight of the latest device is the dual camera setup, a first for Lenovo. Other highlights are the inclusion of Dolby Atmos and the stock UI. The Lenovo K8 Note sports a 5.5 inch Full HD display (1920x1080 at 401 ppi) with 2.5D Corning Gorilla Glass protection which has an anti-fingerprint coating. Under the hood, it has a 10 core 64-bit Mediatek Helio X23 (MT6797) processor. The 10 cores are distributed in 3 clusters: Four A53 cores at 1.4 GHz, four A53 cores at 1.85 GHz and two powerful A72 cores at 2.3 GHz. Two variants will be available, one with 32 GB internal memory and 3 GB RAM, and the other with 64 GB memory and 4 GB RAM. Storage is expandable via microSD card, upto 128 GB. The memory card slot is a dedicated one. Support for USB OTG is also present. 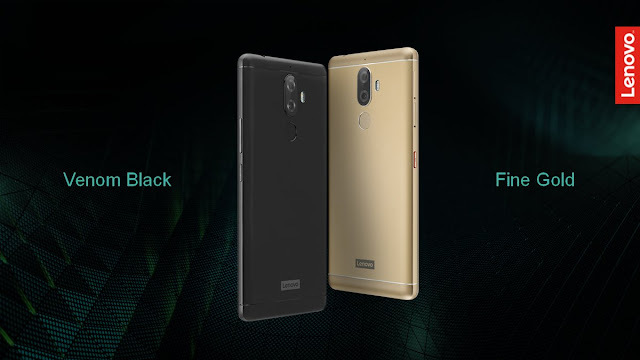 The highlight of the device is the dual camera setup, which has a 13 MP main sensor and 5 MP secondary sensor to obtain depth information. This will give a DSLR like bokeh effect upto f/1.2. The front camera also has a 13 MP sensor which is accompanied by LED flash to enhance low light selfies. Surprisingly, Pro Mode is available on the front camera too. A dedicated Music key is present to the left side, which can also be programmed to launch any app. TheaterMax and Dolby Atmos will enhance the multimedia experience on the phone. However, there is only one speaker. Along with Gorilla Glass protection to the display, the smartphone is also protected by a nano-coating which means the device is splash proof. 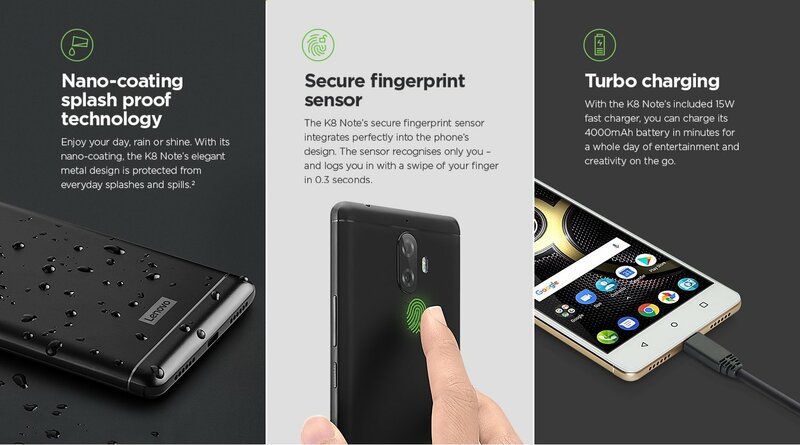 For the first time, Lenovo is ditching their Vibe Pure UI and the K8 Note will be having stock Android, which will help the company to release software updates and security patches faster. It will be running Android 7.1.1 Nougat out of the box with support for Google Assistant. 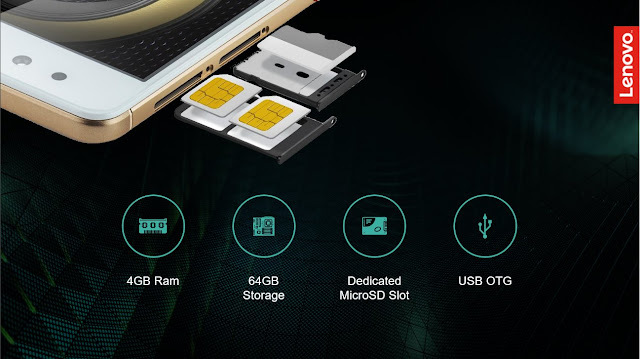 Regarding connectivity, the phone supports dual nano SIM, with abilities upto LTE Cat 6 which supports 300 Mbps download and 50 Mbps upload speeds. Dual band Wi-Fi 802.11ac connectivity, GPS and Bluetooth 4.2 are also supported. Sensors included are accelerometer, proximity, compass, gyroscope and fingerprint reader, which is located below the rear cameras. All these are powered by a 4000 mAh non removable battery. A 15 W fast charger will be supplied in the box, which is also a first for Lenovo. The charging/data sync port is microUSB, not Type-C. The device measures 154.5 x 75.9 x 8.5 (mm) and weighs at 180g. The 32 GB and 64 GB variants will be priced at Rs. 12,999 and Rs. 13,999 respectively. The devices will be sold exclusively via Amazon India from 12 PM IST on August 18. Two color options are available - Fine Gold and Venom Black. There are attractive launch offers too, which includes a Rs. 900 discount on the Moto Sports Headphones, up to 80 percent off on Kindle eBooks (up to Rs. 300) and an Idea data offer of up to 64GB of 4G data with unlimited calls for 56 days at Rs. 343. 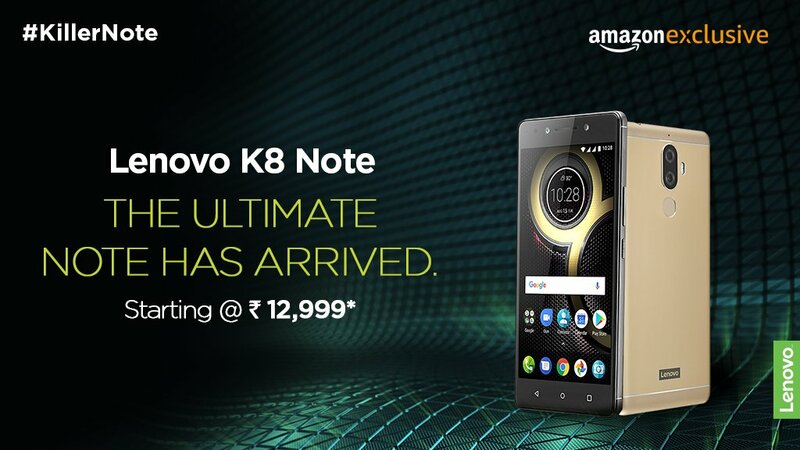 Links To Buy: Lenovo K8 Note.